Sweltering heat and an overindulgent festive season leads me to consider cool, refreshing, healthy eating. It's a good way to start the year. See if you can make it last! When I think simplicity; tomato, avocado and fresh basil salad springs to mind. It's the foundation of traditional Caprese salad, a renowned Italian dish celebrated world wide for a very good reason - it's delicious. The first time I ate it, in its home country, was while I was working in Switzerland and I crossed the border for lunch in Italy - so over the top! Buffalo mozzarella is the traditional accompaniment to this salad. It's difficult to come by, and the price is restrictive so I use dollops of yoghurt. I have recently been introduced to The Gourmet Greek yoghurt. You'll find it on the Midlands Meander and I strongly recommend it. For those of you who follow me on Twitter and Facebook you will have read me waxing lyrical about the quality of this thick and creamy yoghurt. It works so well in this salad. Try it you won't be disappointed! A smoked salmon terrine, in many different forms, is a popular dish on our menu here at Hartford House. As the years go by - and I get more adventurous - the ingredients become more complicated. But now I'm focussing on simplicity and highlighting the delicate smoked salmon. For me, eating an apple on the core is uninteresting - unlike a peach, plum, litchi and mango - but when it comes to using it in a dish it offers a fresh crisp texture. This terrine is the heart of any seafood starter - on its own or as a side dish. Let your creativity loose. Any hot, main course on such sultry evenings would be wasted on me. 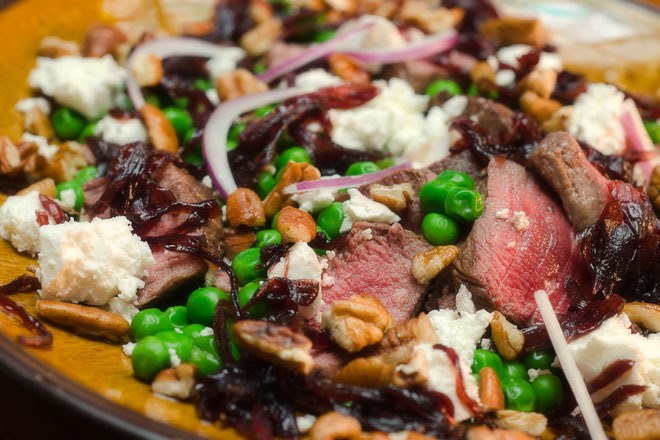 I have, therefore, chosen beef salad with peas, caramelised red onions and soft feta. I know you'll like it too. Nicoise salad is another traditional favourite. It's gone out of fashion because it was over done and made without love. Make this salad with care otherwise it can go horribly wrong. Tuna, salty anchovies, perfectly-boiled new potatoes, boiled chicken/quail eggs, local olives, tomatoes and crunchy green beans - with or without croutons - promise a flavoursome explosion. We owe gratitude to the foodies/chefs of yesteryear whose experimentations have given us everlasting culinary masterpieces such as this one. 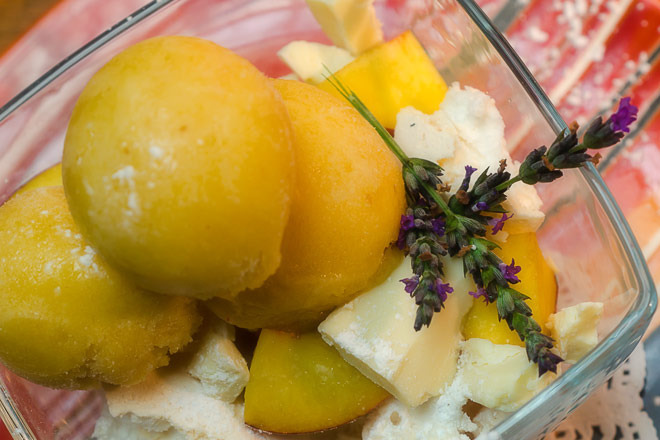 To end on the sweet side, homemade meringues, chunks of Belgian chocolate and my favourite... fresh apricot sorbet, with any available stoned fruit, add a hint of brilliance to the end of the meal. Have you ever tried homemade marshmallows? They are so easy when you know how. Just follow my recipe. You must make sure you have a sugar/digital thermometer - and check that it works! Serve these light and fluffy mouthfuls with fresh granadilla pulp, and cocoa sorbet, which is the 'surprise' component of silver sugar balls. Here you have an interesting balance between sweet and tart.